Sunderland in action against Whitby on Saturday. 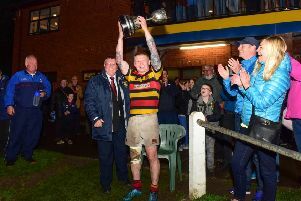 Investing in youth has paid dividends for the Ashbrooke side, as they prepare to face Ryton in Durham’s Junior Cup Final tonight at 7.30pm at Durham City’s Hollow Drift ground. 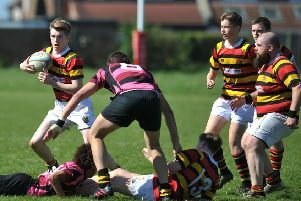 It is fair to say Ashbrooke is a happy place to be playing rugby, as the club have consolidated their position in the league while blooding many of their successful Colts’ side in the first XV. The next step is to beat fellow Durham and Northumberland Two outfit Ryton, after overcoming Sedgefield at Hartlpool Rovers last week. Ryton finished just one place above Sunderland in the regular season in sixth place, but only recorded one win out of their last five – ironically against Sunderland at Hill View. With the league season only ending on Saturday, the thought of playing in the final could be seen as a distraction, particularly as Sunderland only wrapped up their campaign with a last minute 21-23 loss to promotion-chasing Whitby on Saturday - but it has had quite the opposite effect. “From day one there was no hiding it – that’s what we’ve bought into and we are looking forward to what will be a tremendous challenge,” said chairman Paul Geehan. Geehan said: “With the weather in Spring having its effect, every week the players have had a league or cup game, injury kicks in and there is a certain amount of unavailability. The last time Sunderland reached a county cup final was in 2004, when they lifted the junior cup after victory over Bishop Auckland.